Your boat deserves the very best! That’s why Sea Hawk Paints trains and certifies professionals on the proper techniques for surface preparation and bottom system application. Our industry leading certification program gives boat owners the confidence that their Sea Hawk bottom system is applied correctly. So, when your bottom job is done by a Sea Hawk Certified Boatyard/Applicator you can relax knowing the workmanship is top-notch and that your vessel is covered our 1-Year Limited Warranty, THE INDUSTRY’S BEST WRITTEN GUARANTEE*. 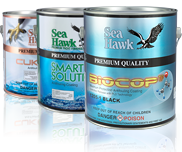 As a Certified Sea Hawk Boatyard/Applicator, your facility will be providing the highest standards in marine paint application which translates to making your customers happy time-and-time again. We will train your bottom system team in every aspect of bottom system service. From assessing the job, to preparing the surface, to applying the coatings. Well make sure that you have the skills required to master even the most difficult jobs and come away with the confidence that emanates from applying the industry’s leading premium quality antifouling products that are backed by THE INDSTRY’S BEST WRITTEN GUARANTEE*. Find the antifouling boat bottom paint that’s right for your boat using our Bottom Paint Selector wizard.